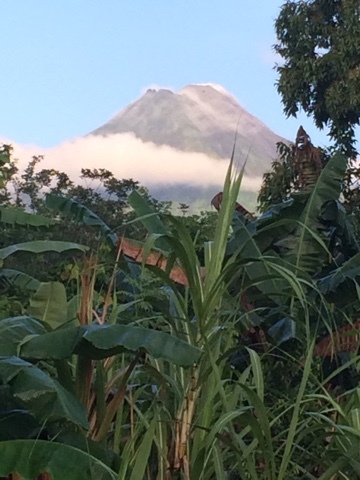 Good morning from the town of La Fortuna de San Carlos at the base of the Arenal Volcano in north central Costa Rica. 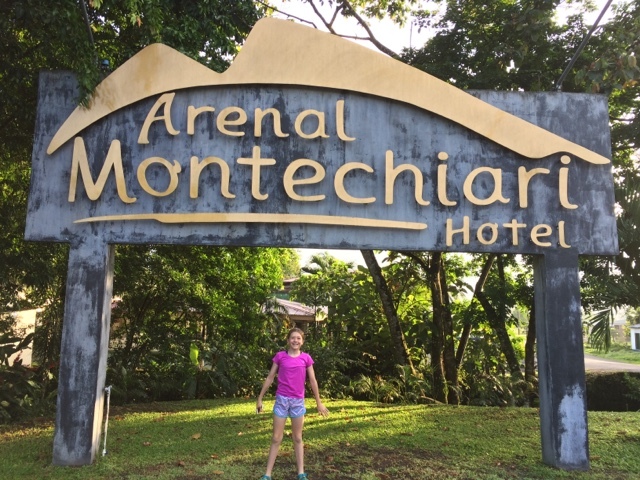 We are staying at the Arenal Montechiari hotel which is a rustic lodge (think Camp Kern with private bathrooms) at the base of the volcano. 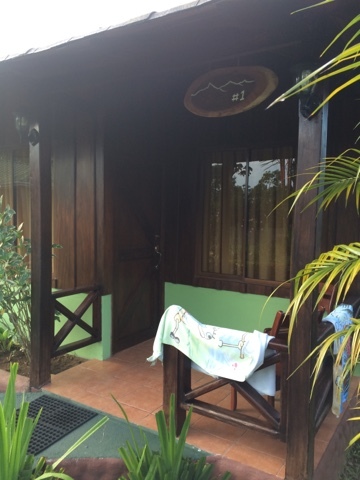 The grounds are lush and the view of Arenal is spectacular. We are here for two nights. The photo above is the view from my cabin’s front porch. 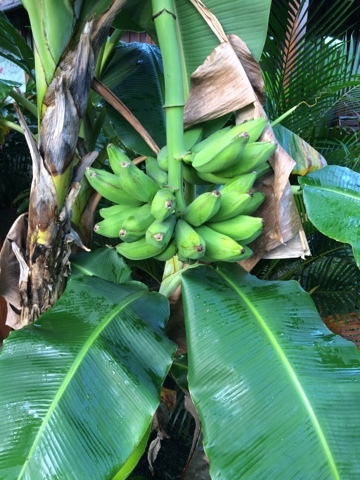 One can find all sorts of flora and fauna here on the grounds of the hotel including these bananas outside my cabin. 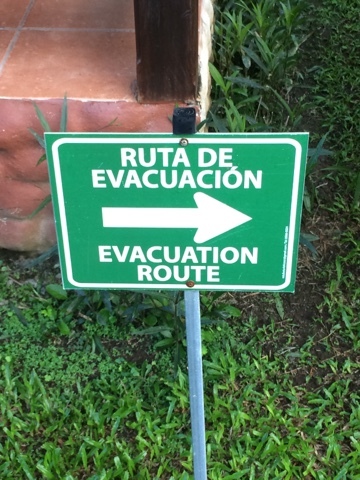 We laughed at the Evacuation Route sign until we realized that we are truly sleeping in the path of a volcano. The Arenal Volcano has been inactive for about 9 years. Since then, tourism in the town of La Fortuna has dropped. This is also due in part to the financial crisis of 2008. In spite of this, 60% of all visitors to Costa Rica make their way to this area due to the variety of activities available here. For example, one can experience zip lining, hiking over hanging bridges, kayaking, soaking in hot springs and more. During our two day stay, we are scheduled to kayak, hike in the hanging bridges and visit hot springs. Before getting our start today, Molly and I took an early morning nature walk that turned into a Hiit workout. We walked about a mile and a half away from the resort and stopped at various locations to do push ups and sit ups in the shadow of the volcano and next to a variety of wildlife. 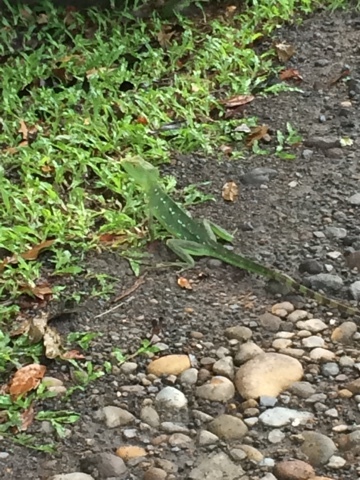 On our walk, we saw snake skins, large lizards, live and dead butterflies and a squashed frog :(. It was a great start to the day. The sun comes up around 5am here, so we had to find a way to kill the time until our 8am breakfast. 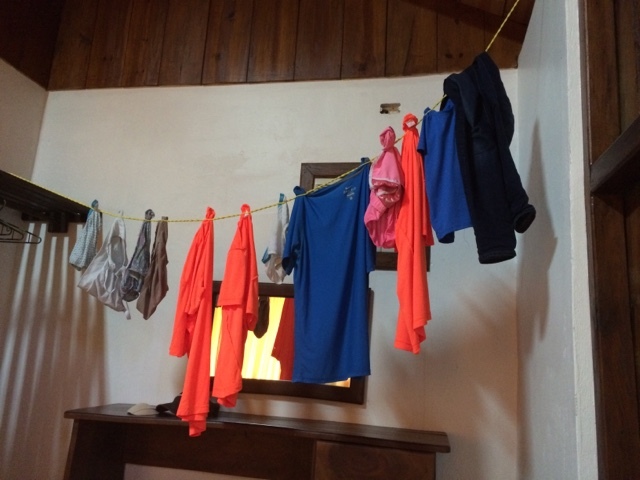 Upon returning to the hotel, I did my first “load” of laundry and hung it in my room to dry during the day. We only packed four outfits for a ten day trip, so this will become part of my travel routine. Some things are no different on the road than they are at home. Laundry is just one of those things! After the walk and laundry, we had our first breakfast here at Montechiari. Of course, there was fruit! We had fresh watermelon, pineapple, banana and PAPAYA! I encouraged all of the youngsters to try it. Most of them didn’t pick it up because they didn’t recognize it. Shame shame! 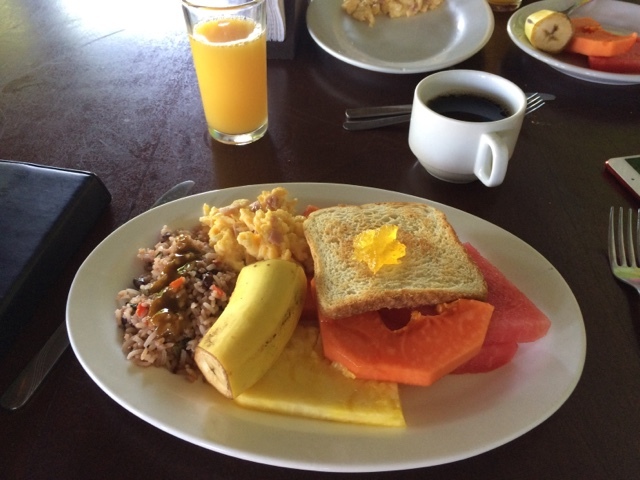 We also had toast, eggs with ham, gallo pinto, toast, pancakes and coffee. It was a tasty start! 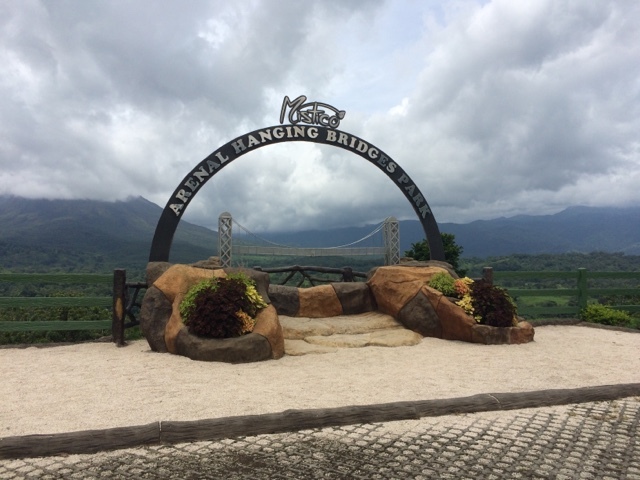 Our first stop of the day was the Mistico Hanging Bridge park. 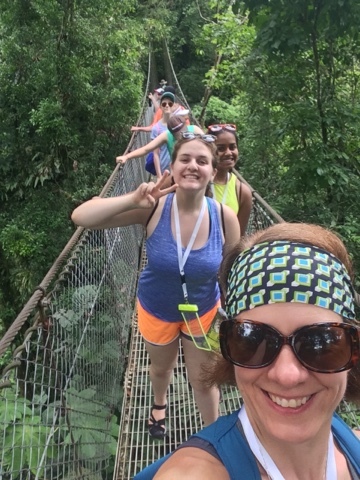 This was a delightful 2 mile hike through the rainforest with 6 hanging bridges of varying lengths and stability. 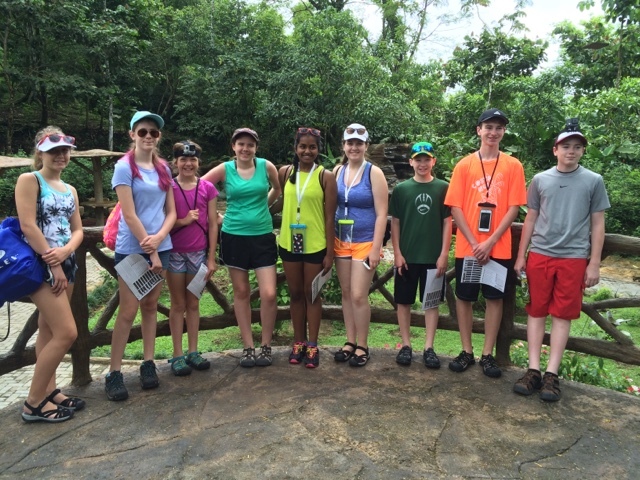 The kids enjoyed seeing (and hearing) many types of birds and insects. We saw a red frog, a huge spider and a snake. The elusive monkeys were not visible today. Lunch was at a pizzeria in the town of La Fortuna. 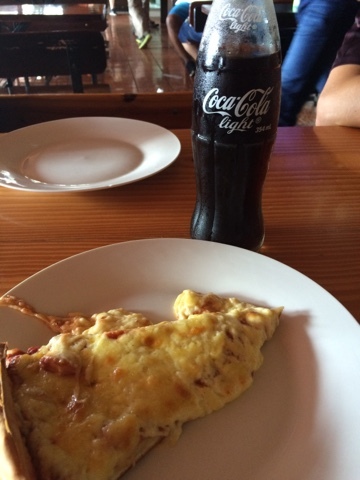 It was pizza and Coke. The kids were thrilled! After lunch, we walked around the town square for a few minutes. My girls and I found a small ice cream parlor and enjoyed cones for about $1.40US. I had guanabana sorbet. Yum! After lunch, we journeyed back to the hotel to change for kayaking. As anticipated, the afternoon storms rolled in right as we were putting on life jackets and we ended up postponing until tomorrow. Shockingly, the kayak company was surprised that we wanted to cancel. Um, hello…water, kids, metal oars and lightening…not a good idea. 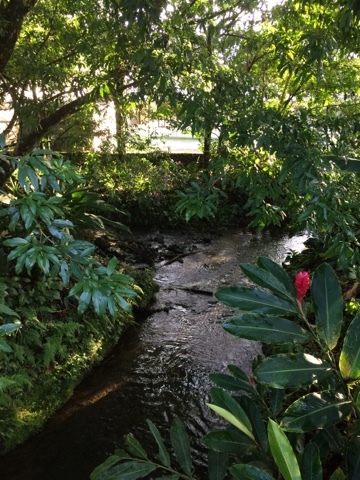 Instead, we went to the Baldi Hot Springs Resort to experience a water park filled with many natural hot springs of varying temperatures and sizes. It was amazing! For two hours, we walked from one spring to another experiencing the good life. The kids had never seen anything like it. Picture Soak City or the Beach Waterpark. Then, imagine all the water is heated naturally and surrounded by lush vegetation. Then, add LCD televisions and swim-up bars everywhere you look. It was a true paradise for adults and kids that would never be possible in the US. Too much liability on the slides and with the available adult beverages along the way. Very limited visibility in between pools would make it a lifeguard’s worst nightmare. Oh yeah, there were no lifeguards anywhere. I did not try the water slides after watching the kids (and a few adults) come shooting out of them. Kim, if you are reading this, envision the adult mineshaft at Camp Kern sans knee pads and elbow pads and then add raging hot water into it. You get the idea! Unfortunately, I did not take my camera into the park because I didn’t want to get it wet. You will have to use your imagination along with the image I have painted above to get the idea. 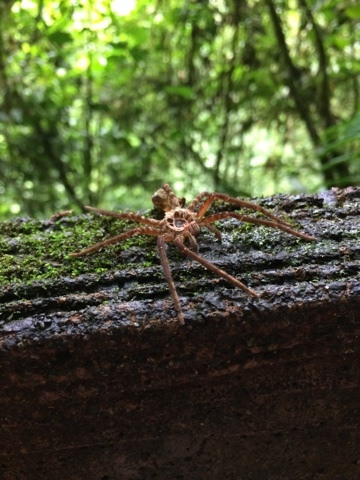 If you are ever in Costa Rica, I highly recommend it! Baldi is one of, if not THE largest hot spring resort in the area. After the hot springs, we returned to My Coffee for dinner. I had patacones again without the mystery meat. We returned to the hotel and most of us went straight to our cabins. My girls watched the Warrior Cavs game, in Spanish, while I headed to bed. On Saturday, we will kayak in the morning and then head to Monteverde. From what I’m told, this is a 4 hour trip where the last 20 miles take 2 hours as the bus must travel up the side of a mountain on a dirt road with large holes. I’m tripling my Bonine dosage.